This post is sponsored by Sparkling Ice but, as always, the content and opinions expressed her are 100% my own. Thanks for supporting the brands that make this blog possible! 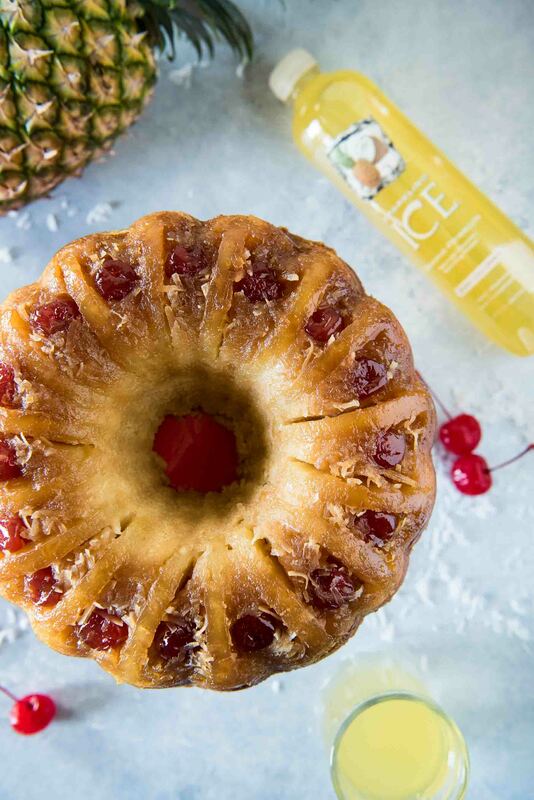 This Pina Colada Bundt Cake is unlike any you’ve had before! 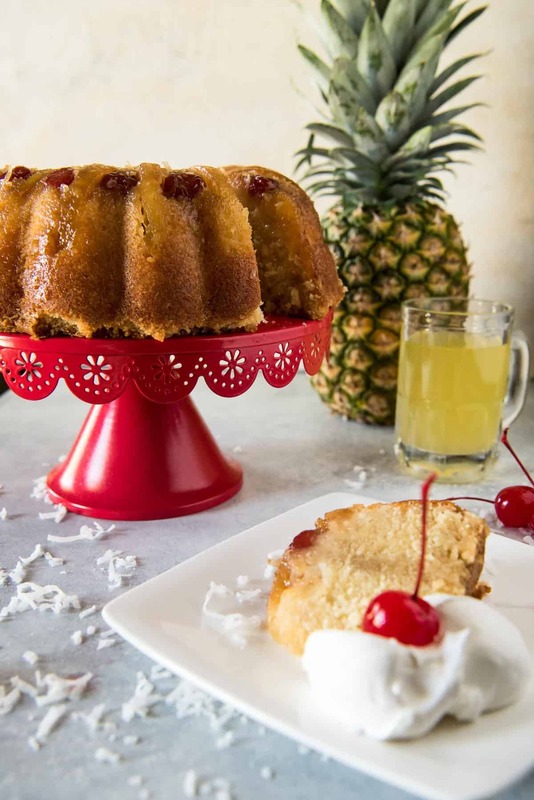 It takes the base of an old-fashioned soda-based cake and flips it on its head, turning it into a moist, tropical cocktail-flavored confection! If you like pina coladas….you’ve come to the right place! Except we’re not drinking them. Don’t get me wrong: I’m not burned out on cocktails. I just thought I’d switch it up and make one into a cake today, instead. It’s my Blogiversary week, after all. How about that. I almost completely forgot that this week marks my third year blogging! I’ve been so caught up in my job change, entrepreneurial hustling, getting back into my old gym rat habits, playing way too many video games, and working on a top secret project, it must have just slipped my mind! I AM celebrating this year though, with a HUGE change that’s coming to the blog really soon. I don’t want to give too much away, but I really think you’re all going to love it! 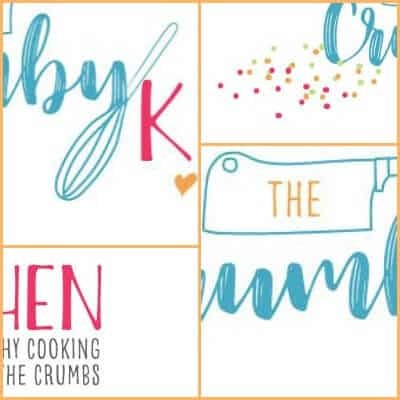 It’s colorful, fun, and is really the most authentic way to present our lives in our Crumby kitchen. 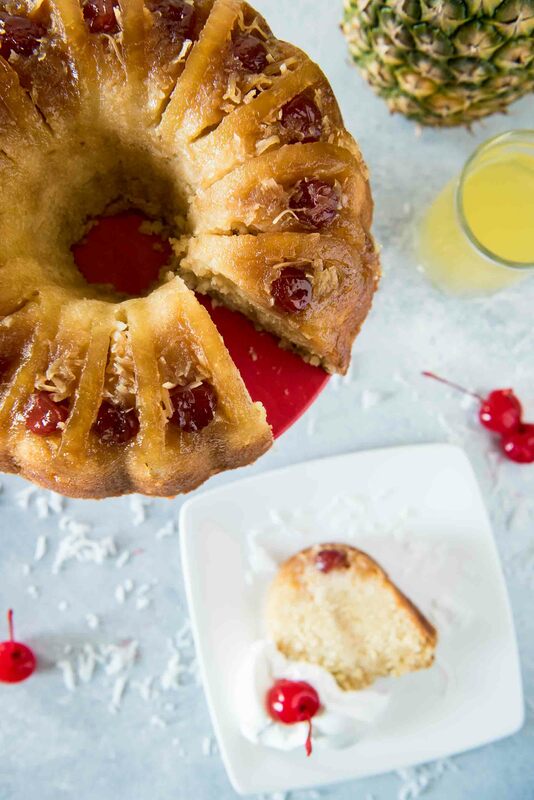 Hopefully you’ll love it as much as I ended up loving this freakin’ pina colada bundt cake. The inspiration behind this cake is something called a 7UP Cake, something my Nana used to make every now and again. The unique thing about that cake is that, instead of using a leavener like baking soda, you use a fizzy citrus soda. Somehow, magically, the bubbles in the soda make the cake rise and the whole things turns out super fluffy and delicious. Because everything’s better with bubbles. I thought it would be fun to try it with sparkling water. Namely, Sparkling Ice (the only flavored water I actually enjoy) since they have, like, 15 flavors to choose from. For this recipe, obviously, I used Coconut Pineapple. Considering the absolute and utter success of this recipe, I can’t wait to try it out again with the other flavors! The cake batter itself is a simple recipe, albeit with the sugar ratio drastically reduced from the old-fashioned original. 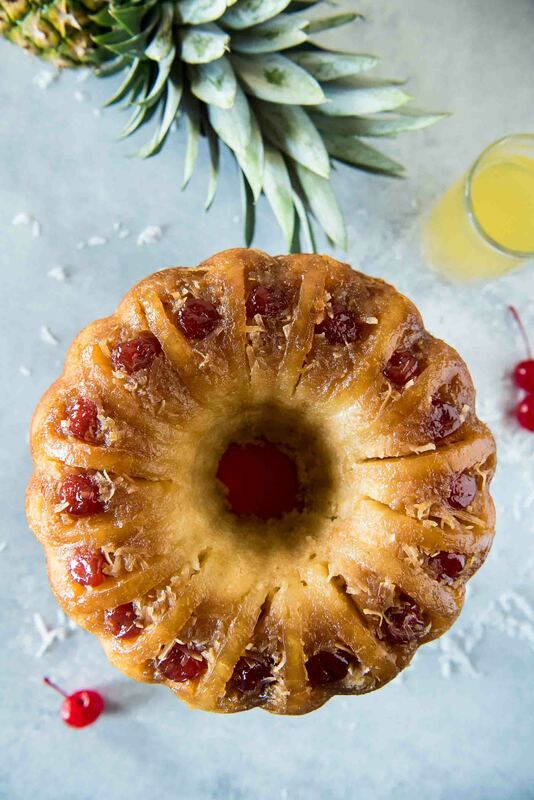 The top looks fancy, but it’s simply halved pineapple slices, maraschino cherries, and a dusting of coconut flakes set inside the bundt pan. You bake it all up, then drizzle a good, boozy butter rum syrup all over while it’s still in the pan. This leads to a bit of a soggy bottom (a la Mary Berry) as most rum cakes tend to have, but I promise you won’t care one you take your first bite. My friends at the 4th of July shindig I took it to sure didn’t! 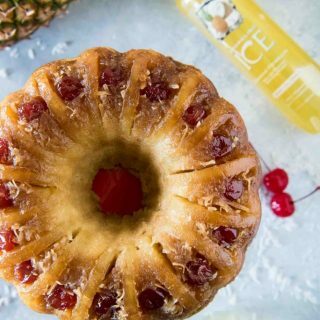 This Pina Colada Bundt Cake is unlike any you've had before! 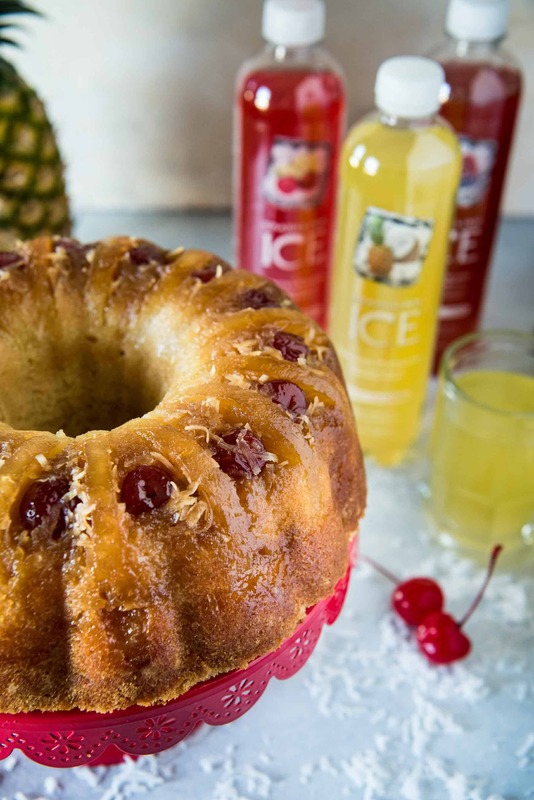 It takes the base of an old-fashioned soda-based cake and flips it on its head, turning it into a moist, tropical cocktail-flavored confection! Preheat oven to 350 degrees F. Spray or butter a 10-inch fluted bundt pan. Set aside. Melt 1/4 cup of butter and pour evenly in the bottom of prepared pan. Sprinkle 1/3 cup brown sugar evenly on butter. 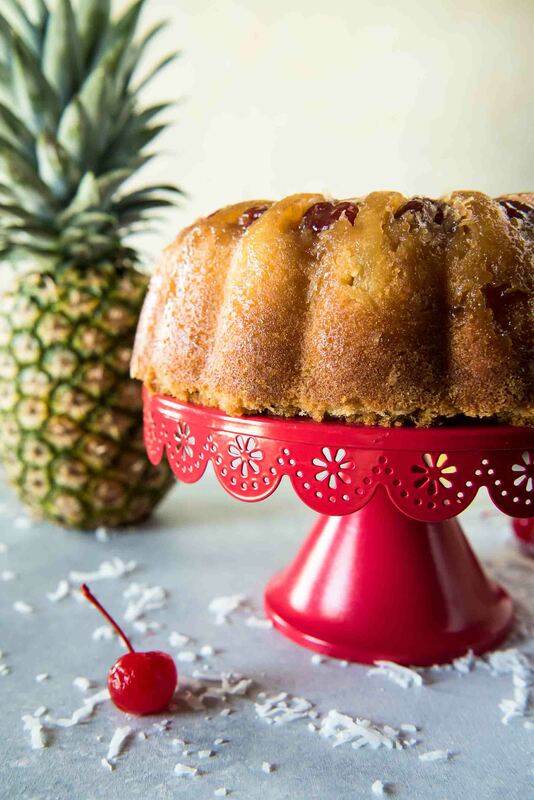 Arrange the 16 halved pineapple slices around the pan, placing cherries in between each slice. Sprinkle coconut flakes evenly around pan. Set aside. In a large bowl, cream remaining butter, oil (or applesauce), and sugars for 4-5 minutes until light and fluffy. Add eggs, one at a time, beating well after each addition. Beat in pineapple juice, extracts, and salt. Add flour alternately with sparkling water in 3 separate additions, mixing until just combined. Transfer batter to prepared pan. Bake 65-75 minutes (covering with foil at the 20 minute mark to prevent burning) or until a skewer inserted in center comes out clean. Remove from oven. In a small saucepan, combine 1/2 cup butter, 1/4 cup sparkling water, brown sugar, and salt. Bring to a boil over medium heat and continue to boil for 5 minutes, stirring constantly. Remove from heat and stir in rum. Cool for 10 minutes. Using a skewer, poke deep holes into cake while it’s still in the pan. 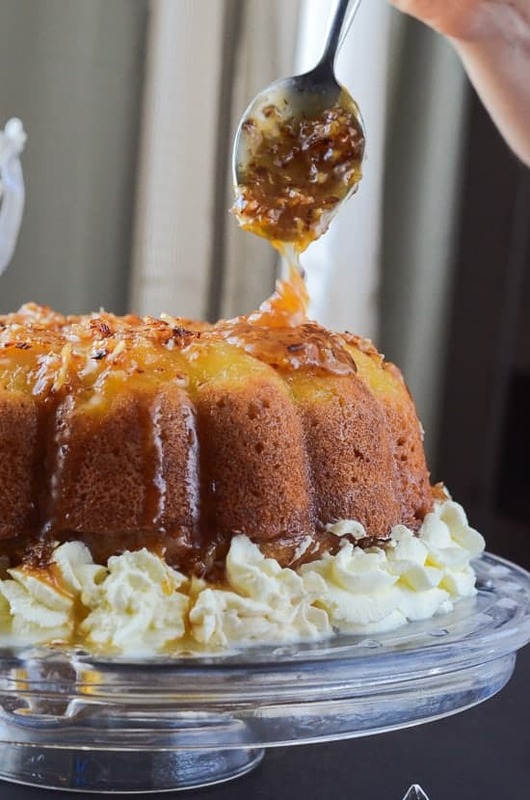 Pour 1/4 cup of the syrup over the cake, allowing it to soak in before repeating until all the syrup is used. Cover the pan loosely with plastic wrap and allow the cake to sit 3-4 hours to (ideally) overnight at room temperature to cool completely and soak. When ready to serve, carefully invert onto a serving plate. 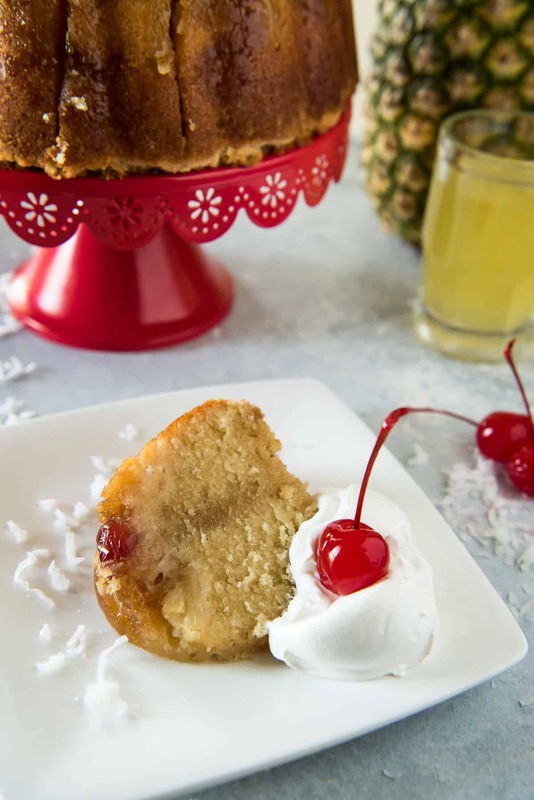 Serve with homemade rum whipped cream for even more flavor! Store this cake covered at room temperature for best results. Can be frozen for up to 1 month. Looking for more cake recipes? 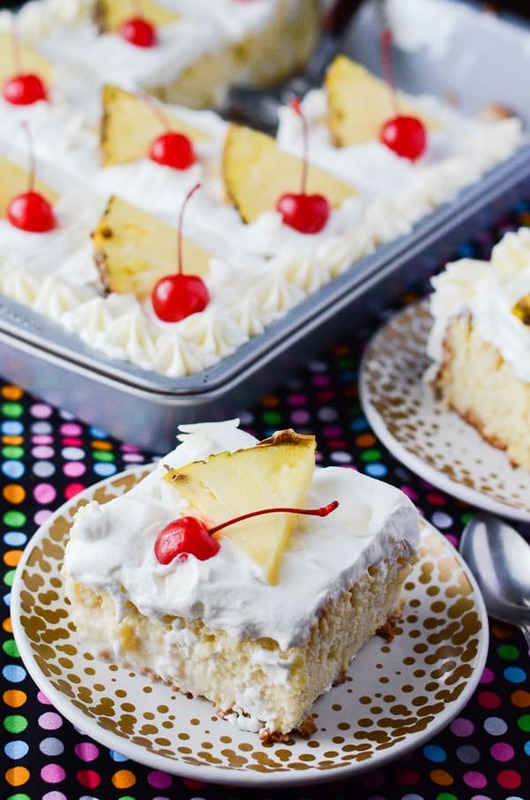 Or how about more pina colada treats? Oooohhh GIRL. This cake!!! You had me at pina colada. I just wanted to ask you how or where do you get those nutrition label for every recipe? I’ve been searching for sometime now and i don’t know where to get it or how to get it? Is it a sofware? I love your cakes. Will gonna try some for an upcoming party. Hi Jenn! The nutrition facts actually are built into the recipe plugin that I use – but if you’d like to get nutrition facts for your own recipes, I love to use this site (https://www.verywell.com/recipe-nutrition-analyzer-4129594). You just plug in your ingredients and amounts, and serving size, and it gives you all the info! I hope that helps!